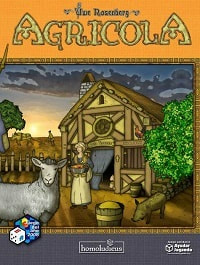 Agricola - In Agricola, you're a farmer in a wooden shack with your spouse and little else. On a turn, you get to take only two actions, one for you and one for the spouse, from all the possibilities you'll find on a farm: collecting clay, wood, or stone; building fences; and so on. You might think about having kids in order to get more work accomplished, but first you need to expand your house. And what are you going to feed all the little rugrats? The game supports many levels of complexity, mainly through the use (or non-use) of two of its main types of cards, Minor Improvements and Occupations. Agricola is a turn-based game. There are 14 game rounds occurring in 6 stages, with a Harvest at the end of each stage (after Rounds 4, 7, 9, 11, 13, and 14). Each player starts with two playing tokens (farmer and wife) and thus can take two turns, or actions, per round. There are multiple options, and while the game progresses, you'll have more and more: first thing in a round, a new action card is flipped over. Problem: Each action can be taken by one player each round, so it's important to do some things with high preference.